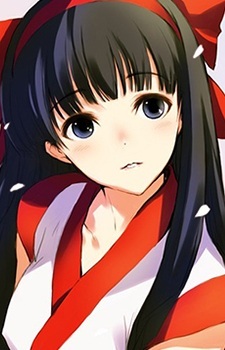 Nakoruru is an Ainu priestess and a defender of mother nature in the SNK franchise, Samurai Spirits (Samurai Shodown). She has a sister named Rimururu, and a violent alter ego named Rera. Nakoruru carries a kodachi (short sword) and fights alongside a tamed hawk. At 15, she and Rimururu are playing in the forest when Mamahaha flies in holding her father's sword. Sensing her father was in danger, she leaves. Upon reaching Hinowa, Nakoruru tells Gaoh that his war is hurting the planet. Gaoh proclaims he will build a new country and will destroy any who would stand in his way. At his defeat, Kamui appears before her, asking Nakoruru to follow her father's footsteps as he was killed. Nakoruru asks what would happen if she declined and is told another maiden would be asked to be the successor. Not wanting Rimururu to be put at risk, Nakoruru accepts to become the new Kamui warrior of Kamui Kotan. She continues to fulfill this role throughout the series protecting nature and defeating villains often alongside Haohmaru. However, after overthrowing Mizuki Rashojin, she sacrifices herself to restore nature's balance and becomes one with the spirit of Nature. In Samurai Shodown 64, her apparent death is retconned. Instead of sacrificing herself, she slept within Kamui Kotan's forests and was protected by the spirits of nature. At nature's beckoning, she awakens to fight the disturbing presence caused by Yuga the Destroyer. Sometime after Yuga's second defeat, she eventually returns to her slumber. Nakoruru is calm and gentle. She seems to be shy toward people. To others, her mannerisms and appearance make her seem rather "doll-like," a term that she somewhat displeases. She is also maternal, chiding her sister as she would a child. She believes that Nature can be protected without killing others and often vies for non-violent solutions if she thinks it's possible. Although she is dedicated in her mission, she also desires to be a normal girl with selfish desires. Later in Warriors Rage, she transcends even further and melds her soul with Gaia to become a Divine Spirit in nature's service. As one of the "Maidens of Light," she travels across space and time to prevent the disasters of the world from occurring. However, she is stopped in her quest by a magical spell cast by Jigen Taishi in Ritenkyo. This leaves Nakoruru unable to assume her original form, and she can only battle evil through the strength of her fellow forest sprits. Weakened, she knows she must stop Oboro's evil plan, but cannot without the Maiden of Light Rimururu, who has been sealed by Oboro. She sets out on a quest to free her sister and together combine their powers to defeat evil. In Edge of Destiny, she follows the runaway Rimururu, hoping to protect her younger sister from the danger that she sensed. She also left her home to tell Rimururu the reason why she is in her current predicament.